If you live in a small home, such as an apartment, you’re going to want to buy the best mini crib to make the most out of your small space. The best baby cribs aren’t necessary all gigantic, you’ll be surprised at the number of great small cribs for small spaces there are, just perfect for families where space is at a premium. It’s not recommended you go out and buy the first mini cot you come across. Like any baby product you purchase, it’s important to do some research and read a few of the best mini crib reviews to ensure you’re purchasing the best small crib not only for your small space but also for your baby. 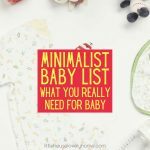 In order to make the search for the perfect space saver crib a little easier, I have put together this guide on the best cribs for small spaces. In this guide, I help you understand the benefits of small baby cribs as well as the various features to consider when purchasing a small baby bed. I take a closer a look at all the best baby crib brands that make mini baby cribs such as a few cribs from the Dream On Me mini crib range as well as a few cribs from the Davinci mini crib range and a whole lot more. 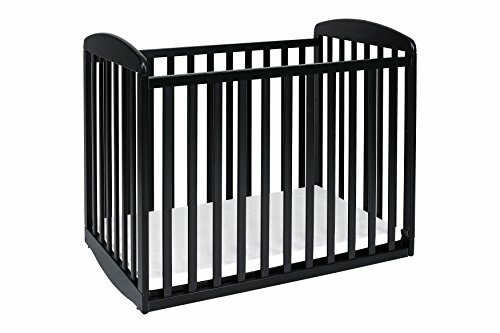 Whether you are looking for a mini crib with changing table, a mini crib that converts to a toddler bed, a mini crib with wheels, a mini crib with storage or just one of the good cheap mini cribs, I have no doubt you will find what you’re looking for right here in this baby cribs for small spaces guide. 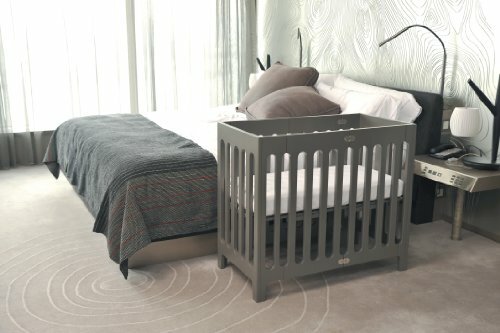 OK, so a mini crib vs standard crib – what is the difference? A mini baby crib is pretty much the same as a standard baby crib but a much smaller version. Mini cribs are designed for families that live in small homes and apartments where space is at a premium. Little cribs for babies that can convert into a toddler bed. 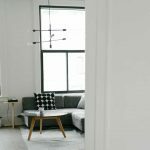 Don’t have time to read all the cribs for small space reviews? My pick for the best space-saving baby bed is the Babyletto Origami Mini Crib. 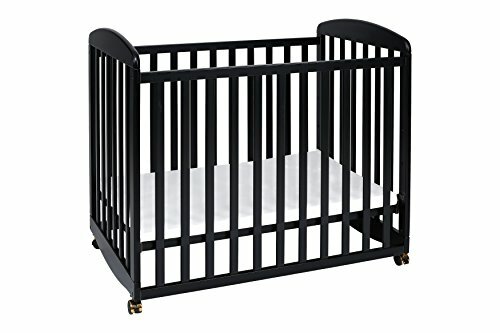 I love this crib because it looks super modern and has so many great features for such a reasonable price. 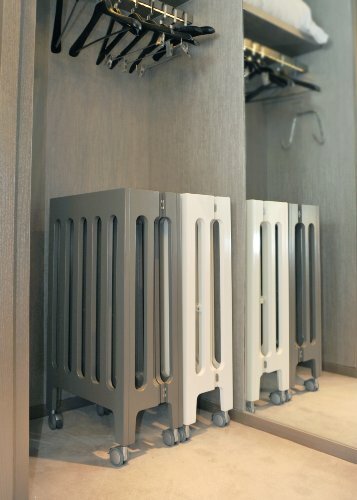 It is on wheels and is super slim so you can easily move it around the house or apartment, and it is collapsible while in a standing position so you can easily pack it down and store it away while not using it if you are really tight for space. One of the main reasons the Babyletto Origami tops the list for the best mini cribs is its adaptability. It’s a great option to have if you plan on using it for more than one baby as it is easy to pack away and store until it is needed again without taking up much space at all. Below is a quick comparison table of all the top rated mini cribs in this guide. Keep reading below for a more detailed look at each compact crib. 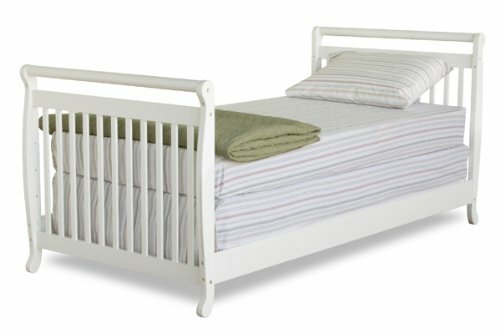 What to consider before buying a small crib? Like standard sized cribs, small cribs for sale come in many shapes and sizes and with a range of features. Before purchasing a minicrib, consider the following features. In the case of a mini baby cot, size does matter. I mean the whole reason you’re purchasing a small infant bed is that you don’t have the space for a standard size crib. Before purchasing a small baby cot, measure the area where the crib will go and compare these measurements to any compact baby crib you consider buying. When it comes to small rooms, even an inch really can make all the difference. If your space is super tiny, you may even need to consider one of the tiny cribs that fold when not in use like the Babyletto Origami, so you can reclaim some of the space back when baby is not sleeping in the cot. As you can see from the comparison chart above, even tiny baby cribs vary greatly in how much they weigh. If you don’t intend on moving the cot around too much, the weight may not be an issue. However, if your space is that small that the cot will need to be moved from room to room, or even around within a single room, consider the weight of the crib. Better yet, look at purchasing a small crib with wheels. Does it Convert to A Bed? Some of the baby mini cribs on sale can convert into a toddler bed, day bed, bed with a headboard and footboard as well as twin bed. Often a small convertible crib is more expensive than a compact baby bed that doesn’t convert into a toddler bed, but in the long run it can work out more economical as it will grow with your child. Often to convert into a bed, mini cribs require a conversion kit. Sometimes this included, but other times this is an optional extra. I recommend that if you do want to convert your mini crib into a bed down the track that you purchase the conversion kit at the same time as the crib in case the crib is later discontinued. Before purchasing an infant mini crib, double check that it comes with everything you need, or if it doesn’t how easy it is to purchase whatever it is you require. Does the crib come with a mattress or is this an additional purchase? Does it come with sheets? Do you need to purchase specially designed sheets? Don’t just assume that your mini crib will include everything you need. In fact, some of the top mini cribs just come with the basics so you can choose a mattress and bedding to meet your own individual requirements. If you purchase a mini crib and mattress combo, often the included mattress is fairly basic and thin, so you may want to consider buying a better quality one. Keep in mind that the average standard cot mattress is 28 inches wide by 5 inches long, whereas the average mini crib mattress is 24 inches wide by 38 inches long. Like all baby products, small infant cribs come in a range of colors and designs. The comparison table includes the various colors that each mini crib included in this guide comes in, so you can be sure to choose a color to match your décor. There is a range of additional features that mini cots may include. Features may include wheels, built in storage or drawers, ability to fold up or convert to a bed as discussed above. Usually, the more features the heavier and more expensive the mini crib and the less compact it becomes. So be sure these additional features are necessary before you purchase a mini crib with all the bells and whistles. One important feature to look for is an adjustable mattress height. Babies grow at an astonishingly fast rate, so it is important to be able to lower the mattress height as they grow to avoid them being able to climb out. I have included the number of mattress heights for each mini crib in the comparison table. Certified – Most countries around the world have strict legislation when it comes to baby products. 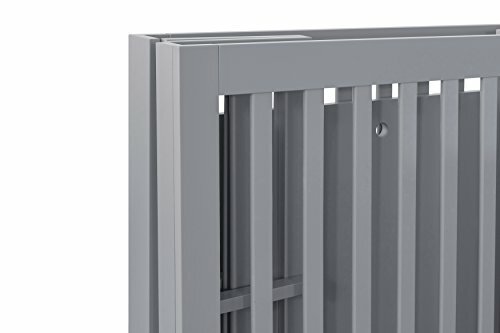 Ensure the mini crib you are considering purchasing meets the requirements within your country. 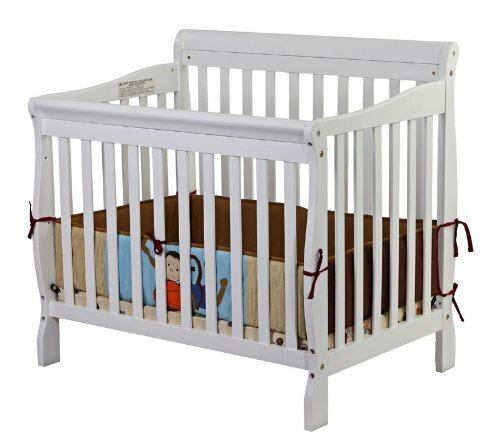 Durable and sturdy: The best rated mini crib will be of high quality and made with well-designed materials. Ensure the mini crib you purchase is free from any safety hazards such as bumps, sharp edges or protruding parts that could injure your child. Perfect Fit Mattress/Sheets: It is important that you only use the mattress supplied or specifically designed to go with the mini crib to ensure that it is well fitted and suited to that crib. The mattress must be firm and fit snugly without any gaps between the mattress and crib, this ensures the baby is not trapped between these gaps. Dream On Me is a brand which makes a variety of highly regarded baby cribs and so it is not surprising that this review features two of their mini cribs. 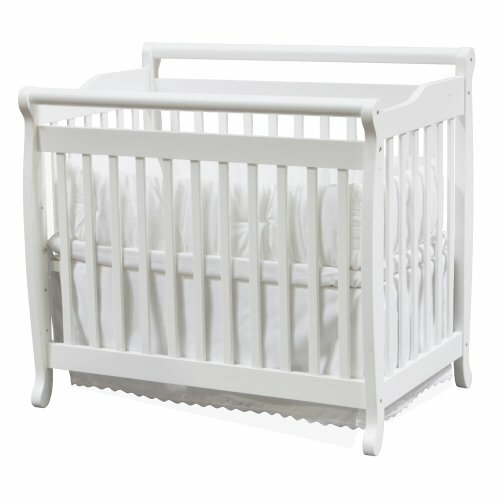 The Dream On Me 4 in 1 Aden Convertible Mini Crib is a highly recommended, good value mini crib. 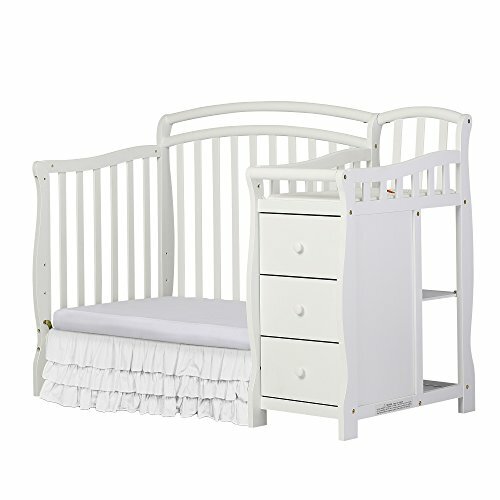 If you’re looking at cots for small spaces, the Dream On Me Aden mini crib is perfect. At 20 inches wide, this is one of the narrowest mini cribs in this guide and despite being constructed from solid wood it only weighs 20 pounds which is the also the lightest in this guide. This is the perfect small wooden cot for families that need a narrow crib that is easy to move from room to room. This apartment size crib includes 3 different mattress heights and can convert into a day bed, toddler bed and twin bed with the optional conversion kit. This cot is suitable for newborn babies to children of around 40 pounds. It is important to note that bedding and mattress are not included with this narrow baby cot. 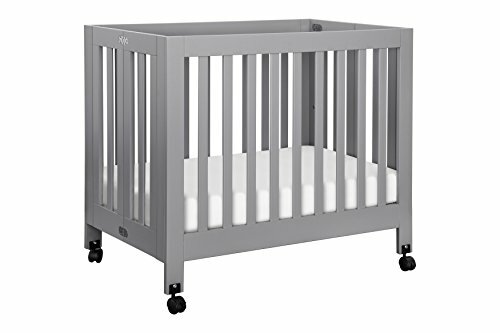 It is clear from reading a variety of Dream On Me Crib reviews, that the Dream On Me 4 in 1 mini crib offers great value for money (it’s one of the cheapest in these reviews) and perfect for families needing one of the small baby cribs for small spaces. 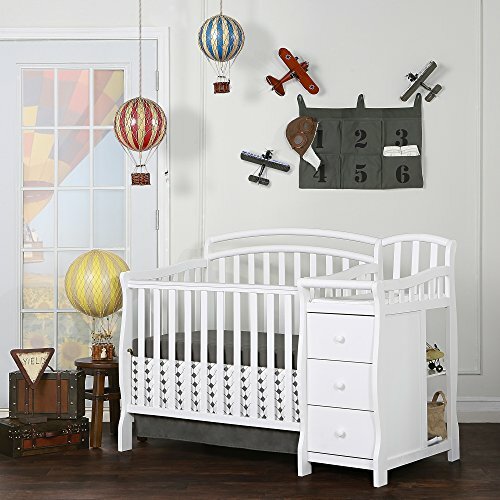 Another great mini crib from Dream On Me is the Dream On Me 3 in 1 crib. 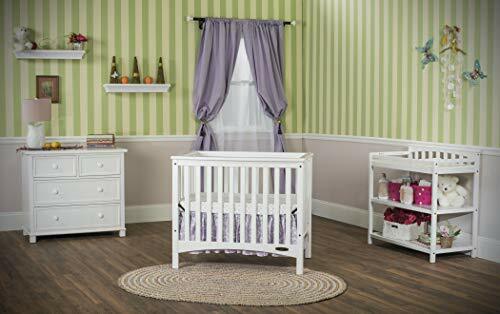 This mini crib for small spaces has great features and many extras that can be purchased separately to complete the bedroom package. If you are looking at small cribs with storage, then the Dream On Me mini crib with changing table is the perfect option. There is also the option of buying a conversion kit, so you can convert it into a day bed, toddler bed & twin bed so it will grow with your child. 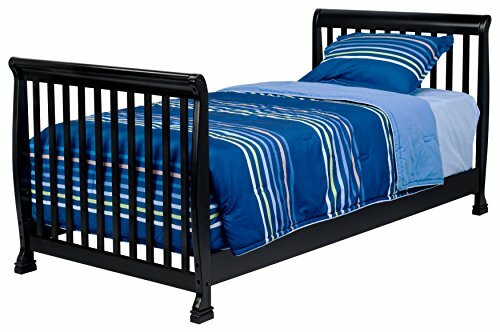 The bedding and mattress are not included within the price but all the tools for assembling this small crib are included. 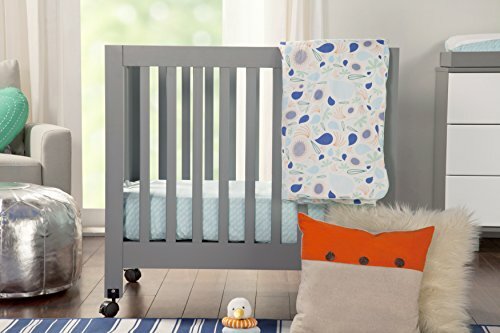 This baby cot for small spaces is the largest out of all the products in these reviews with a length of 57 inches and width of 29 inches, so it is definitely not suited to a super small space but is still a far smaller option than a standard size crib. 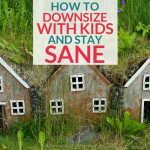 It is also the heaviest crib in these reviews weighing 65 pounds so would not be recommended if you are going to need to move it around from room to room. This is a great option if you are looking for a mini crib with drawers or a small crib with changing table for a compact nursery at a reasonable price. 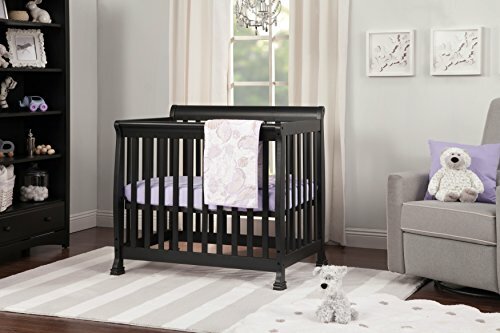 The Davinci Kalani 2 in 1 mini crib is another great option when looking for compact cribs for small spaces as it measures 40 inches long and 29 inches wide and weighs only 38 pounds. 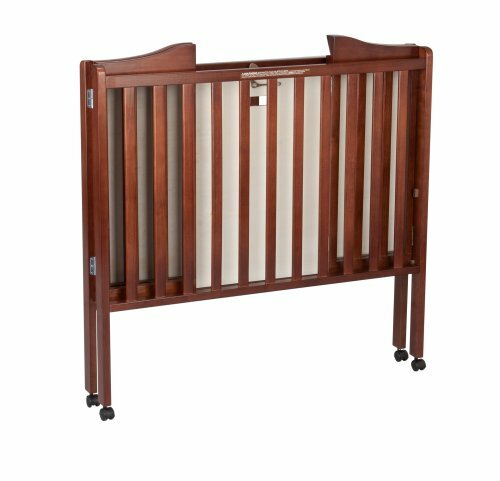 This crib includes all the features you’d expect from a good quality crib such as 2 adjustable mattress positions and lower profile for easy reach. For one of the cheaper cribs it’s great that it still has the option of converting into a twin-size bed with the conversion kit which is an optional extra. You will also need to buy the mattress and sheet sets separately for this baby crib. 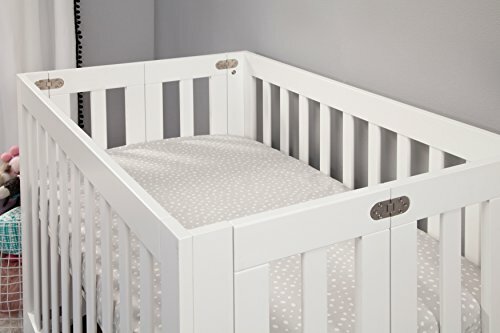 Various Davinci Kalani mini crib reviews report that this crib is a safe and sturdy crib that is great for small spaces and is also beautifully made. The Davinci Emily Mini Crib is a great choice to consider when looking for convertible cribs for small spaces at an affordable price. With a length of 40 inches and width of 28 inches, this crib is a lot smaller than a standard size crib and weighing only 35 pounds, it’s easy to move from room to room. This crib has a lower profile to make it easy to reach your baby and has 2 adjustable mattress positions, so it can continue to be safe as your baby grows. Also, like many mini cribs in this guide, it can convert into a twin size bed with the optional conversion kit. Whilst it does include a 1-inch waterproof pad, reading the various Davinci cribs reviews, other parents recommend purchasing the 4 inch Davinci mattress, made specifically for this crib. The Emily Davinci mini crib is a very popular crib and perfect for families living in small spaces. The Davinci Alpha mini crib is a great option to consider if you are needing the flexibility of moving it around your home while also ensuring all the most important safety features are included. With a length of 38 inches and width of 26 inches, you will easily be able to manoeuvre this rolling mini crib around the house to position it as needed. With the wheels off, this mini crib converts to a rocker. It weighs only 26 pounds and has four adjustable mattress positions so you can ensure your baby is always at a safe level while sleeping or being moved around in the crib. The Davinci Alpha mini crib includes a 1-inch waterproof pad however many parents recommend purchasing the 4-inch Davinci mattress which is sold separately. 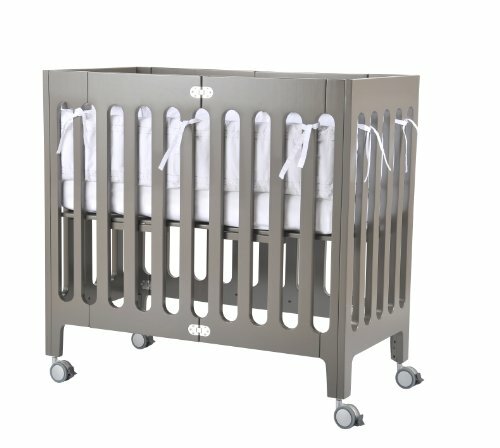 Various Davinci Alpha mini rocking crib reviews report that this is an awesome crib that saves heaps of space with super easy assembly. 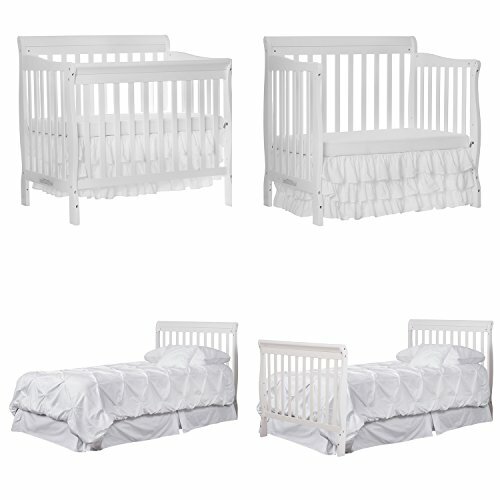 Overall, a great option when looking for cheap baby cots for small rooms. 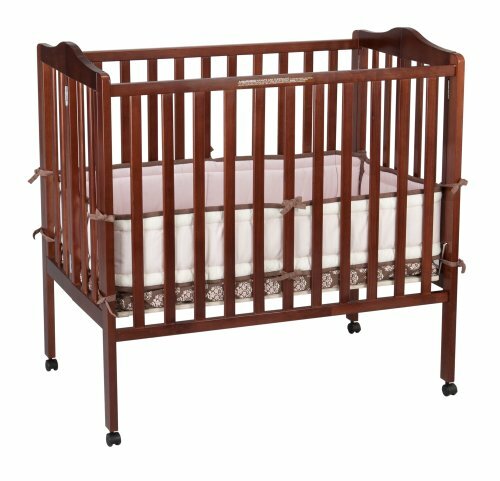 The Davinci Annabelle Mini Crib is another great choice when looking for cribs for small apartments or houses with not a lot of extra space. This crib has two adjustable mattress positions and has the option of converting into a twin bed with the optional conversion kit. Like also the Davinci mini cribs in this guide, this cot comes with a 1-inch waterproof pad but the optional 4-inch Davinci mattress is recommended. 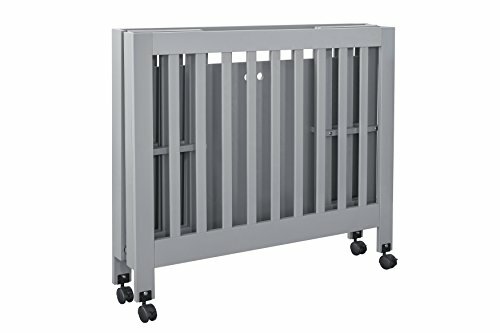 The slat strength of this crib is 149 pounds so there is plenty of room for your baby to grow and you won’t have to worry about your baby being too big for the crib for a long time. With a length of 42 inches and a width of 27 inches, and weighing only 39 pounds, this is a great crib to consider when looking for the best baby cribs for small spaces. The Bloom Mini Crib is the smallest crib available in these reviews with a length of 37 inches and a width of only 20 inches. It is also the most expensive crib in our reviews, but you can see why when you see the modern design, sturdy build and extra features. The Bloom Alma Crib is worth every cent with it’s patented no tools required easy set up in under 5 minutes. It also changes so easily from a bassinet for newborns into a mini crib that can comfortably fit your baby for up to 12 months or maybe even longer depending on the size of your baby. This is the smallest mini crib in these reviews and it’s on wheels so can easily be transported from room to room as needed. It can easily fit through doorways. The Bloom Alma mini cot also has a compact fold construction for easy storage, so you can save space by packing it away when it is not in use. This is an especially handy feature for families in small spaces. 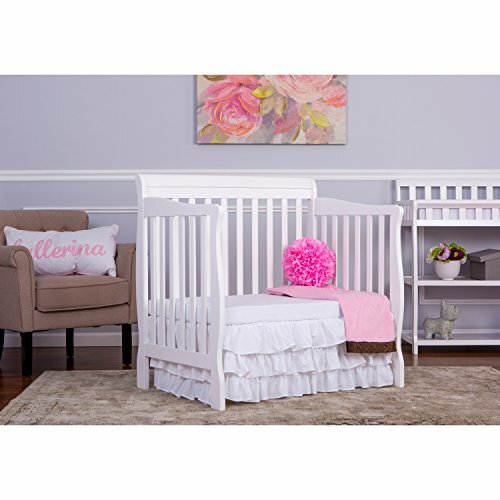 Reading through various Bloom Alma Mini Crib reviews it is clear that this is the perfect choice for families in small apartments and it is a great and durable crib that will see you through multiple children. The Delta Mini crib is a great lightweight multipurpose crib that can be folded flat to make for easy travel and compact storage while still remaining stylish and versatile in design. 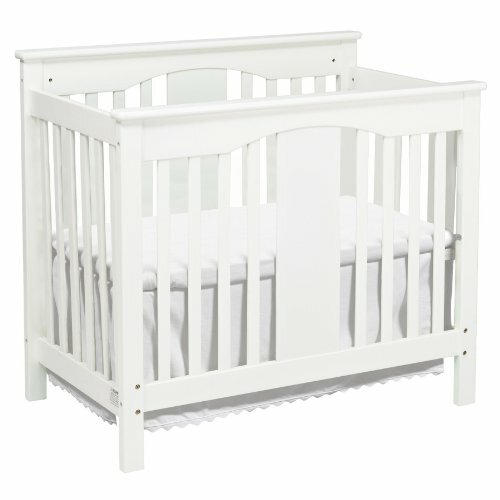 This compact crib has a stationary front and back rail, 4 caster wheels and a strong and sturdy wooden construction. It has 2 mattress height positions and includes a 1-inch waterproof mattress. This mini crib measures 39 inches long by 25 inches wide and weighs only 34 pounds. You will also love how compact this mini crib is folded up. At a mere 6 inches wide, you can easily store it away under a bed or in a closet until your next baby comes along. 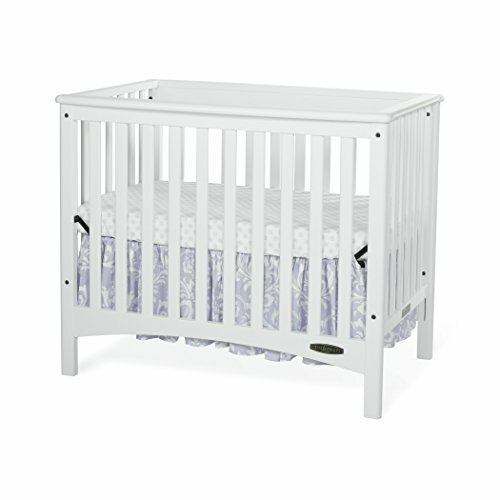 The Delta portable mini crib is overall a great option for a very reasonable price when looking for baby cribs for small rooms. The Babyletto Origami Mini Crib is one of the best space saving cribs available. 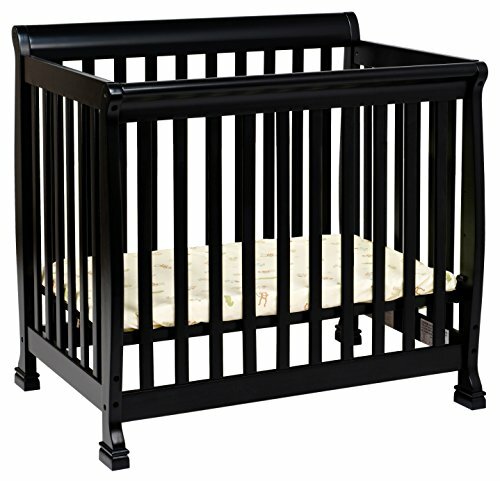 This crib has so many great features and is such a great price for a modern mini crib. The best cots for small spaces are the ones that function perfectly whilst taking up minimum space. So it’s no wonder that parents love this mini crib which has the option to fold flat whilst still standing, whilst its wheels allow you to roll it away, whilst still in the standing position. These are great features to have on a small crib for parent’s room or even for a smaller nursery too. With a length of 39 inches and a width of 25 inches it is a great compact size and at 44 pounds, it’s not too heavy to roll away and move from room to room. 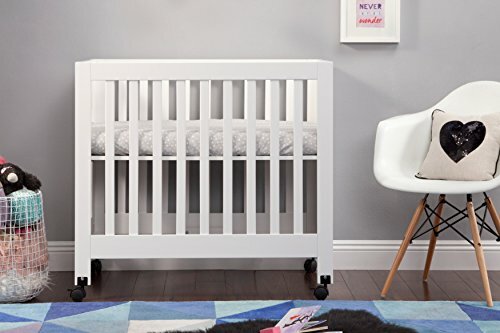 This crib includes 2 mattress height positions, four locking caster wheels, 1-year warranty and a 1-inch mattress pad, however, you will probably want to invest in a better quality mattress. Reading through various Babyletto Origami Mini Crib reviews it is clear that this is a popular choice for parents looking to buy one of the best baby cribs on the market, that can easily be stored away when not in use. The Childcraft London Mini Crib is definitely one to consider when looking to buy baby beds for small spaces. This mini crib can convert into a twin bed with the optional bed rails, so it will grow with your child to save you having to buy another bed. The mattress support adjusts to two different levels, so you can always have it at a safe level for your sleeping baby. A 3-inch non-toxic mattress is included with the purchase of this crib. This crib is 41 inches long and 29 inches wide and weighs 42 pounds, so it is reasonably lightweight to move around but it doesn’t have wheels so would be better off being left in one spot. 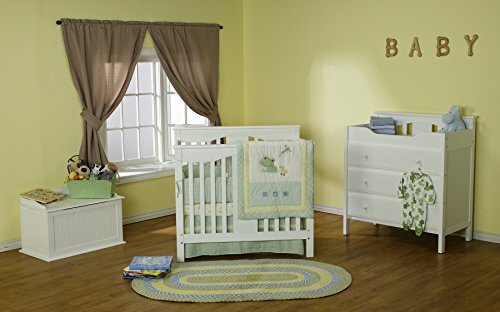 Various Child Craft Mini Crib reviews report that this is a high quality and safe crib that is easy to assemble and being constructed from solid wood is very sturdy.